With less than $5.00 in your pocket and fewer than five minutes of time, you can pack a whole lot of French into your skull with these "Cliff's Notes" style books on language acquisition. ennuyer: to annoy, bore. Il m'ennuie toujours avec ses plaintes. He is always annoying me with his complaints. So, you not only get the word and its meaning, but a simple sentence to translate, and also a useful phrase you might need to describe your dishwasher or gall bladder or husband while traveling. As you work your way through the book at odd moments -- standing in line at the bank, waiting for your child to finish his violin lesson, suffering through the commercials in live television -- you will start seeing the useful words reappear, and get more accustomed to the grammatical forms, just by reading these sentences and translating in your head. The only thing better would be a phonetic pronunciation guide. But we can't have everything -- as evidenced by the lack of a teleportation device for me to use whenever I find my keys. Not to bring me the keys, of course, but to bring me a husband to tell me where they are. I don't know whether I'm meant to commit all this to memory or suffer the indignity of carrying around a tiny book called "Easy French Phrase Book." 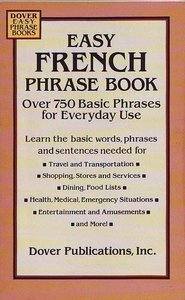 If I memorize it all, good for me, but if I'm toting it about as I tramp around in Paris, am I not marking myself as a lazy ignoramus, unwilling to splurge for the "Freakin' Difficult Ball-Busting French Phrase Book" or even the "Moderately Challenging French Phrase Book"? In my defense, those titles were not available on Amazon.com, but imagine the indulgent grace with which I would be received at Cafe de Flore if I arrived with "Stunningly Exhaustive List of 10,000 French Words to Blow Your Mind" in my hand? Hmm. There are a few outdated or useless entries (I want to buy a bathing cap! What is the charge for developing a roll of film?). But there are lots of phrases here that one could imagine being very very thankful for, such as "I want a guide that speaks English" and "I did not order this _____." (The book gives you words you might use to fill in the blank: soup, cattle, lobotomy.) Speaking of operations, I've been through this whole book at least once, and my favorite by far has to be the following: Je ne veux pas faire arracher cette dent. It means "I do not want this tooth extracted!" Yes, I can imagine that might be the most useful phrase you've ever learned in your life. Unlike the dictionary above, this book provides phonetic pronunciation guides, and is great fun. Put it in your bathroom, and watch your family begin to ask for the telephone, a taxi-cab, and the time in beautiful, useful French. If you’re serious about learning French, go to college. Because the most sensible way to learn anything is to find an expert who will meet with you daily to assign homework, collect assignments, administer tests, and write on the chalkboard in front of you. That’s why we all recall with blistering clarity everything we learned in college, right? If you can’t afford college, go live in France — it will probably be cheaper anyway, and you won’t have to take any ridiculous electives like music appreciation or study skills or “math.” Yes, go to France — that is the answer. You can take your whole family — your homeschooled children, who will most certainly see something educational somewhere in the wilds of Paris, your cyclist husband who is determined to bleed internal organs while climbing the alps, and you can take your sweet, beautiful self. The self that spent five years learning German because that’s the language of philosophy, mother. The self that had free and open access for thirty-one years to a mother who spoke and taught French, yet scorned it as a hedonistic and trivial language. The self who would now like to read Voltaire and Camus and Sartre and Colette, etc. If you’re the type of person who whines petulantly at her computer, “But I don’t know WHY you put the adjective there! What’s the RULE?” and then throws her pop tart across the room, Rosetta Stone might not help you out as much as its pricetag suggests. But enough about software which you can buy at a mall kiosk from someone in a well-starched shirt. Here are seven ways you can learn French completely for free. #1. BBC Online French. The BBC has a ridiculously awesome series of language lessons in a bunch of languages. It’s shocking how much you can wring out of the BBC without paying a dime and without even living in their country or understanding their advertising. Given that NBC has nothing like this, and only wants to advertise the million ways I can get fit or thin or both with Jillian Michaels, I’m grateful for BBC and their generous learn-related offerings. You can even learn URDU with the BBC, and no one even knows where URDU is spoken. That’s how generous the BBC is, when it comes to teaching you foreign words and what they mean. They will even make up languages, or invent grammars for languages they think they may have heard once spoken on the subway or in Narnia or something, and then construct lengthy video tutorials that you can watch right now for free in your own home. The fact that we all aren’t multilingual already, given the opportunities we have, is pretty shameful. I’m ashamed. #2. Put on your jacket. Take it off. Put on your jacket. Take it off. Everything is French Fu. Do you want to haggle with a lavender merchant in Provence? TAKE OFF YOUR JACKET! Do you want to engage a sight-seeing boat on the Seine? TAKE IT OFF! Do you see? Paint the fence! Paint the fence! If you question me, then the bullies have won. #3. Visit your local Francophile Society. If you live near an urban center, there is most likely a French language meet-up close to you. The ones near me, here in Norfolk, are “Alliance Francaise” and “Parlez-Vous Peninsula French Language Fils et Filles Biscuits and Gravy.” Or something. The next meet-up is on my birthday! Too bad I’ll be dead or in another town or really busy on that day. But hey, if you follow that link you’ll see the “Fete de Musique” listed under events — and my kids are playing their violins at that! So I’ll be sure to learn lots of French there, while I’m shrinking into a corner behind a ficus. I mean trying out all the great stuff I learned from the BBC. #4. YouTube. You can spend hours watching French language videos on YouTube, including some that even claim to be instructional, from cute little nursery rhymes sung by French ladies to this video where a cat will teach you French by highlighting different parts of his face and body with a red dot. Feel the learning! Prepare to spend hours and hours and retain nothing but a vague sense that you’ve only just begun watching French videos on YouTube. #5. Watch movies in French with English Subtitles. Take any kids movie that has played in your van from Orlando to Richmond before you ripped it out of the DVD player and ate it, gurgling “I TOLD YOU DON’T PUSH MOMMY” around your gnashing teeth. Now play that movie in French with English subtitles. It will be awesome! Like, in that part where Dory says “Just keep swimming!” you will learn exactly how to say “Just keep swimming!” in French! Except the French translation will probably be way cooler, like “Just keep creating art in spite of the meaninglessness of life! Just keep creating art in spite of the meaninglessness of life!” so this may not always work. Try The Lion King. Try Up. #6. Listen to XM Satellite Radio. Did you know that there are a handful of French language stations on XM radio? This is SUPER AWESOME, trust me. There’s a sport station, which is kind of dull. There’s a news station, which is good for repeating random snatches of the language and just trying to get the tone right, you know the inflection and the general feeling of it, something I am having a hard time doing. But the BEST one is the French music channel! It’s French pop music, and it’s awesome. We listen to it all the time (except when we’re in a tunnel) and we are starting to learn some songs enough to sing along. Now, if you didn’t already have XM radio, this would not technically be free. But if you did, it’s channel 89, Sur la Route. #7. Accquire a child who speaks French. This is the best thing for learning on the go. You’ll need one child who is farther along in Rosetta Stone (or whatever) than you are, and who really enjoys instructing you on things. It will help if you are the child’s mother, because there is nothing that gives a child more sweet, sweet satisfaction than teaching his mother something she didn’t already know. While I spend most of my time trying to avoid learning anything about Bakugan attributes or shortcuts in MarioKart, I actually do want Benny to teach me French. And he DOES it! Example: The last few Fridays we’ve been going to Busch Gardens for the day. 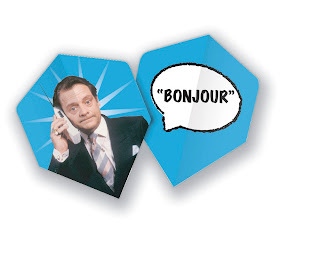 All day, whenever we’re in a line, Benny is teaching me French. Quizzing me on colors. Asking me yes or no questions in French to see if I can answer correctly. Pointing at little pictures and asking me the time of day. Children are so motivated in teaching their own parents that they’re like little free tutors, constantly available, asking only the occasional orange or bit of toast or lump of sugar in return. How far you get down this path without becoming intolerant of the patronizing tone that’s bound to accompany this generous instruction — that’s up to you. So there are your tips for learning a language without spending any money. After this I’m going to learn Japanese by reading the owner’s manual on my camera and comparing it with the English translation. Free and foolproof! Can’t wait. Our family of four travelled to France for the month of July, 2010, to cycle, sight-see, socialize, and explore. We had a very memorable experience in the Loire Valley, the Alps, the Pyrenees, and Paris. Here you can study our preparations, read about our experiences, and learn from our mistakes!